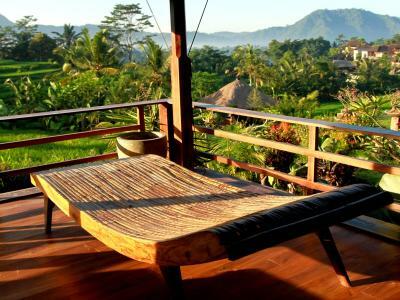 Lock in a great price for Sawah Indah Villa – rated 9.4 by recent guests! The best place we stayed in Indonesia! The views from the restaurant are gorgeous (we couldn't stop taking photos) and the free breakfast is delicious and so filling! Our room was beautiful. I seriously can't say enough good things about this place. I wish we never had to leave! Service was amazing. The view was so beautiful! Super romantic! Great value for the bungalow. The rooms were amazing and open, beautiful pool and staff. 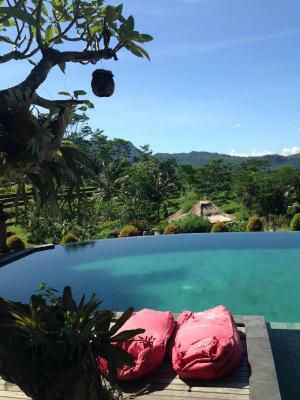 This is such a beautiful villa among the ricefields, the whole area, the view and the pool are amazing. The atmosphere is superrelaxing. The room was clean and spacious and i really loved the outdoor shower. They also helped me to arrange airport pickup and then transfer to another area in Bali. My wife and me stayed two nights at Sawah Indah Villa to explore the Sidemen region. Our stay there was superb. The first night the room we initially booked had just been booked by another guest of the hotel; the bookings coincided. At no extra cost the staff of Sawah Indah villa upgraded us to the family suite, which had an amazing balcony overlooking the rice fields. The rooms, beds and bathrooms were very comfortable and clean; the on-site restaurant offers good value for money and is to be recommended. A fantastic place, favorite stay in Indonesia. Great setting overlooking rice fields. Stylish decor, attention to detail. Super staff, and restaurant. Loved it! The view is amazing, lovely pool & the massage outdoors was great too. A peaceful and beautiful Villa located in my favourite town in Bali. We never wanted to leave the premises it was so relaxing. We had massage, did yoga and relaxed on our amazing Villa balcony, just perfect!! The staff (especially Made YoYok) made our stay very special. Very easy to access sideman and surrounding villages. Location and view are fantastic! Restoran is very good. 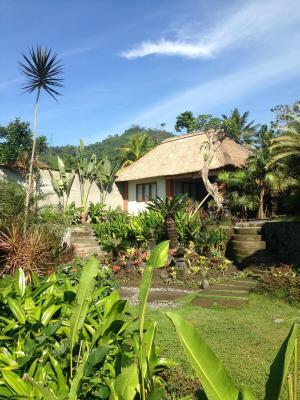 Sawah Indah Villa This rating is a reflection of how the property compares to the industry standard when it comes to price, facilities and services available. It's based on a self-evaluation by the property. Use this rating to help choose your stay! Surrounded by lush green rice fields and mountains, Sawah Indah Villa features an outdoor pool, restaurant and charming rooms with stunning views of the surrounding greenery. Guests can indulge in pampering treatments at the spa. Wi-Fi is accessible for free in public areas. Cooled by a fan, each room in Sawah Indah Villa has a private terrace with outdoor seating. In-room amenities include a mini-bar. Equipped with free toiletries and a shower, private bathrooms boast Balinese-style interiors. A 30-minute drive from the property leads to Tirta Gangga Water Palace, while Besakih Temple is 45 minutes’ drive away and Ngurah Rai International Airport is a 2-hour drive away. Airport shuttle service is available. Staff at the front desk can arrange car and motorbike rental, shuttle service and day trips at extra charges. Ironing and laundry services are provided upon request. At Sawah Indah Restaurant, guests can sample a variety of Indonesian, Thai and Western delights while enjoying calming views of the rice fields. Meals can also be enjoyed in the gazebo or in the privacy of guests' rooms. When would you like to stay at Sawah Indah Villa? Fitted with a private terrace overlooking the rice fields, this fan-cooled room includes a fridge, safety deposit box and a mini-bar. Private bathroom has a shower and free toiletries. Offering an additional space and a private terrace overlooking the rice fields, this fan-cooled room includes a mini-bar, fridge and a safety deposit box. Private bathroom has a shower, bathtub and free toiletries. Suitable for up to 4 guests, this fan-cooled comes with a sofa bed. A fridge and a safety deposit box are included. Private bathroom has a shower, bathtub and free toiletries. This bungalow features a balcony, seating area and mini-bar. Sawah Indah Villa is a Villa which since its inception has only 5 rooms alone but now it has 12 rooms with supporting facilities such as spa, swimming pool and restaurant. 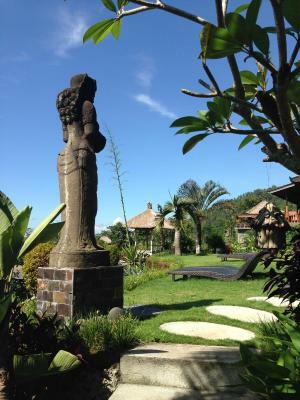 Our hotel is located in the middle field in Banjar Tebola, Sidemen and Karangasem. House Rules Sawah Indah Villa takes special requests – add in the next step! Sawah Indah Villa accepts these cards and reserves the right to temporarily hold an amount prior to arrival. Trying to charge 10% when paying with the creditcard. And then trying to advise to put every bill on the room ! The pool and the garden. Amazing views. Spacious comfortable room. Staff were very friendly and helpful and brought my food to my room as I had injured my leg and had trouble walking. The room we changed to had alot of insects but being so close to nature that is expected. The views here are breathtaking and the staff members are helpful and kind. The place is clean and well kept and the food was outstanding we even extended our stay. I couldn't believe we were getting all that beauty for such a low price, much better than most overrated villas in Bali. We totally loved the lemon grass welcome drink. We will definitely come back. Superb location next tot the Rice fields. Very Nice views from the restaurant. Lovely food. And great swimming pool. We had a luxury room: top! People were very, very friendly! Very beautiful and peaceful place in a hotel area in a small village. No air conditioning, TV... There is a fan in the room for cooling, but ours was broken and they did not replace it. Quiet hotel, located in the middle of rice fields. The pool area is nice with a large infinity pool and unbelievable views of the rice fields. Our room was nicely decorated also we had a large balcony and it was a great place to unwind after a long day. Breakfast was tasty and huge. The staff was helpful and friendly. Everything. It is a beautiful hotel in an amazing location with views to die for!! The options for trips out give the opportunity to see rural Bali in action then come back and relax by the wonderful pool and enjoy the scenery. Staff are fantastic Great value for money. The only thing we didn’t like was having to leave in the morning. We could have easily stayed another night! There were some farmers burning some leaves, the smoke got a bit too much but it didn't linger too long-- so it's ok. The setting was beautiful. 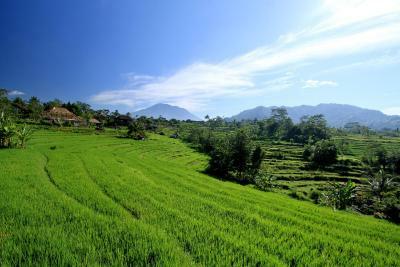 Tranquil and lush vegetation.The best of Bali countryside. The staff were outstanding. Restaurant food delicious.We both were very happy with everything and hope to come back sometime soon. The construction going on next to my room. The loud American music at dinner. We would have preferred none or Balinese music.